I just closed the survey to further entries having gotten several hundred responses. This is quite a large group, and certainly large enough to be statistically significant. 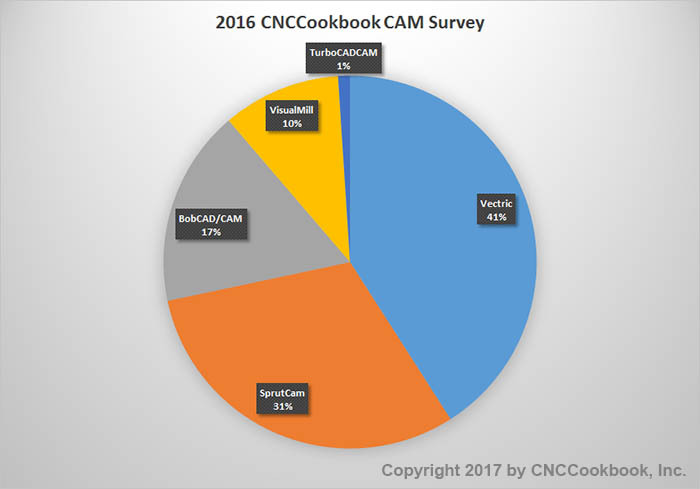 Product Managers at a variety of CADCAM companies, large and small, tell me they find the results very valuable in their own planning. There’s really no other source of information quite like these surveys, so I wanted to get these initial results out as soon as I could. We’ve done these CAM surveys in 2010, 2012, 2014, 2015, and now 2016, so there is historical data to compare against when looking for trends. High-End: More expensive packages with more functionality. Tiered: Modular packages available in a range of configurations that span from the Low-End to the High-End. Low-End: Thees are inexpensive packages most commonly used by Hobbyists, but as we’ll see, they’re starting to come up-market to the Professional World. Let’s take a look by category. Just like last year, the High-End was the largest part of our survey. In fact, it grew from 47% of last year’s responses to 54% this year. The High-End segment also has the largest number of different packages. We counted 29 packages that got a vote! The top 5 players account for about 54% of the High-End Market whereas last year they were 60%. This market remains highly fragmented with a few large players and many medium and small players. Mastercam remains the #1 player, though their share has fallen each year from 27% to 22% and now they are at 20%. HSMWorks remains #2, but their share has fallen from 17% to 14%. Last year’s #3 player was OneCNC with 6% market share, but they have fallen to #10. It’s tough to fight the onslaught of these bigger players, especially the ones under the Autodesk umbrella. 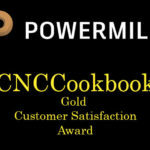 Powermill moved up from #4 to #3 and went from 5% to 7% share. FeatureCAM a big jump from the #11 position, where they were last year. Their share has gone from 3% to 7%, so apparently they’ve prospered under the Autodesk umbrella, just as Delcam (PowerMill), and HSMWorks have. SolidCAM is holding steadily to #5, where they were last year, though their share is up from 5% to 7%. The other solid gainer versus last year were GibbsCam, which went from #13 to #6 and gained share from 2% to 6%. Cimatron and TopSolid slid strongly versus last year. To understand the market share gains and losses better, you’ll want to drill down on some of the other survey analysis such as Share of Mind, Top Features, Top Frustrations, Conversions Rates and Product Strengths and Weaknesses. We’ll be offering those additional reports as premium free content to our newsletter subscribers only. If you haven’t already, be sure you’re signed up for our weekly blog newsletter. There’s a signup down below this article not too far. The Tier-Priced category consists of products that are sold in modular fashion so you can build a CAM package at virtually any price point depending on how much functionality you need. As such they straddle multiple markets from low-end to high-end. 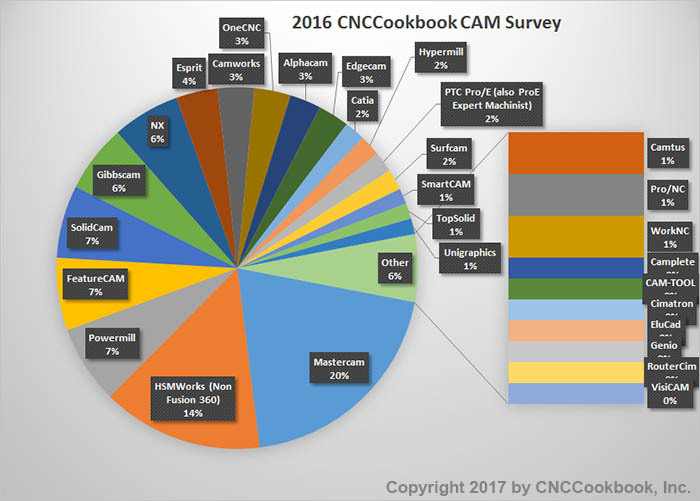 Tier-Priced CAM accounted for 22% of our survey responses. 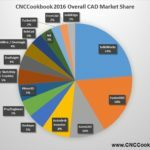 This is the category Fusion 360 has taken the most market share from, and the overall share of this category continues to decline, having been at 26% in 2015. Vectric’s cast of products has soared from #3 in 2015 to #1 in 2016 and their share went from 24% of the segment to 41%, a huge gain. As we saw in last year’s results, customer satisfaction is very high for these products. 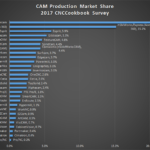 Last year, BobCAD/CAM had moved from #3 (18% share) to #1 with 27% share. This year they’ve fallen all the way to #3 with 17.3% share. Sprutcam remains in the #2 position, but has gained a little share from 27% to 31%. I can’t help but feel their association with the Tormach franchise has helped them all along the way. Visual Mill looks to have been perhaps the biggest loser. They remain #4 in this segment, but their share has been halved from 20% down to 10%. 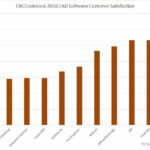 Visual Mill and BobCAD/CAM seem to be the biggest losers to Autodesk’s Fusion 360 growth. It’s just plain hard to argue with free. These are the packages that Hobbyists and “Prosumers” (low-end business + high-end hobbyist) thrive on because their price points are relatively low. 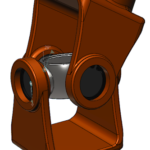 One has to wonder though how many Pros are using Fusion360, which is quite a capable product. This was our second largest category having received 22% of the responses. Nevertheless, that was down from last year, when the Low-Cost Segment got 32% of the responses. Autodesk’s Fusion 360 product continues to crush it in this space. The product is #1 and share climbed from 55% to 67% no doubt at the expense of many others. #2 player, CamBam, saw share fall from 17% to 10%. MeshCam remains #3, with share falling from 15% to 9%. 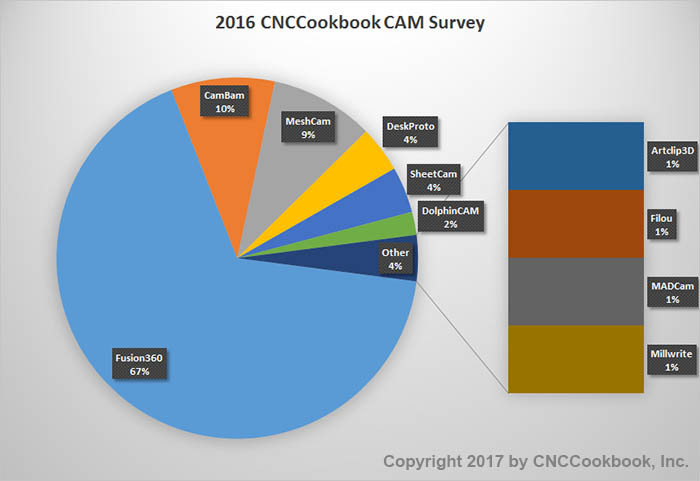 DeskProto, SheetCam, and DolphinCam all kept the same positions and lost little share. Want to Learn More About These CAM Packages? This year we asked a lot more questions in the survey than simply, “Which CAM packages are you using?” We added questions relating to Customer Satisfaction, Favorite Features, Biggest Frustrations, and more. We learned a lot, but it’s really too much for one article. If you’re evaluating CAM packages for purchase, you need this information to make the best choice. After all, isn’t feedback from existing users of any particular package some of the most helpful information to have for a buying decision? If you’d like to know more, no problem. Just sign up for our weekly newsletter and we’ll give you a link that allows you to download our beefy and free PDF report on the survey as soon as it’s available. A little later, we’ll publish more installments with even more information. Stay tuned for these follow-up articles, but for now, sign up for our weekly digest of new CNCCookbook blog articles and we’ll give you the PDF report for free. To sign up, scroll down and use the form below where it says, “Like what you read on CNCCookbook?” Nothing to it! What would also be interesting is to break these results down by country or continent? I mean, the CAM systems most popular in Europe might not be the same as the most popular ones in the US or even Canada? Thanks for the work in compiling this survey, it is very interesting. Martin, yes, it would be interesting. I have two thoughts on that though. First, we’d need a LOT more responses to keep things at all statistically significant. I’m not sure how feasible that would be. Second, I’m curious what sort of technical differences in the software you think would be relevant to consider for a country-by-country breakdown? I understand the curiosity, but what’s the practical benefit of such a breakdown? 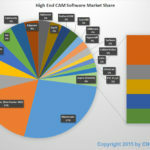 How would the “High End CAM” pie chart look if you included Fusion in there? I know you have it in low cost, but since their cutterpaths are the same as HSMWorks, you could make a case for putting it there. Jeff, perhaps you could make the case, perhaps not. It would certainly be #1 as it’s free. Fusion360 is only free for non-commercial/startups and education. Companies doing real work pay $300 for 3 axis and $1500 annual for 3+2 and 5 axis. I don’t see how the old model of High/mid/low based on price reflects how the market is changing. It makes for difficult apples to apples comparisons. I started on ProE and ProMan in 1994 and spent 14 years doing 3, 4, and 5 axis, plastic injection mold, and electrode machine tool programming and sys admin. Since then, I have used CimatronE, Prospector, and PowerMill. I have spent the last 2 months (July/Aug 2017) trying to get Creo NC up and running. It is the worst major software application I have ever tried to use. I like the design side but the NC side is a complete disaster. The only reason I can use it at all is because of my experience and knowledge level. Even with that, I cannot create tool paths reliably. 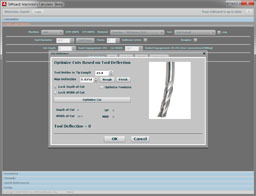 It is very obvious that the people overseeing NC do not know anything about creating CNC toolpaths. I consider NC to be an insult to PTC’s manufacturing customers. We are throwing it out and getting different software. I know there is better software out there and would tell everyone to avoid Creo NC unconditionally. It really is that bad.